You know how sometimes you learn about a movie or a book and are so eager to see or read it that expectations are sky high? And then the reality doesn’t meet expectations because they had become so unrealistic? 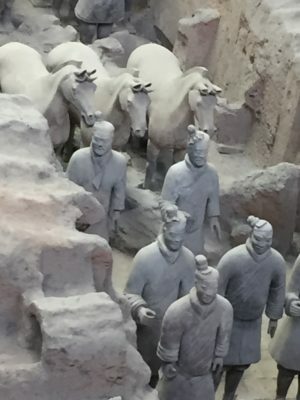 I had concern that seeing the Terra Cotta Warriors in Xi’an could be one of those experiences for me. But it wasn’t. It made me cry. Here’s the back story. In 221 BC, a king named Qui Shi Huang became the first emperor of China. He was 39 years old. His dynasty was called Qui (pronounced Ching). There were then 20,000,000 people living in China (today, there are 1.3 billion). Qui was powerful and charismatic. He unified all of China with written language and currency. It was very important to him to protect his afterlife, so at the age of 13 when he became king, he began construction of what would become a 56 square kilometer burial site consisting of his tomb (what appears to be a mound of grass-covered earth originally 120 meters high), and 600 satellite tombs. 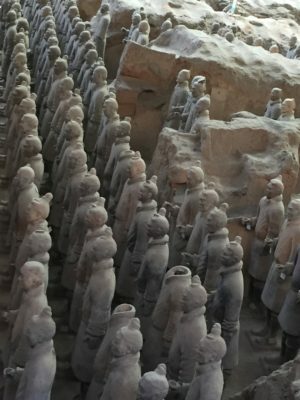 The written history tells us that 720,000 forced laborers constructed this enormous undertaking that included 8,000 clay warriors of various ranks, as well as clay horses and 40,000 weapons. One day in 1974, a few local farmers were digging a well and accidentally came upon a startling discovery. 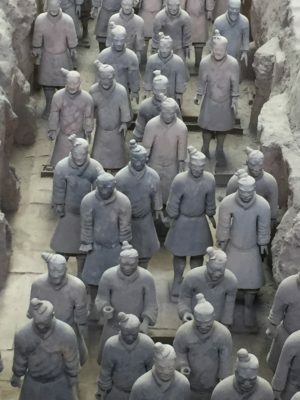 They found what would turn out to be the Terra Cotta Army! Excavation began immediately. What archeologists exhumed were fragments of clay soldiers and horses. It turns out after Qui died of mercury poisoning at the age of 50, a general ransacked the satellite tombs destroying the soldiers and taking the weapons. Apparently, he didn’t want Qui to have such a fabulous afterlife. And obviously, Qui’s unification of the country wasn’t as successful as Qui thought! The tomb itself, however, has never been opened as it was dug so deeply underground. To date, 1,000 warriors and horses have been reconstructed. Archeologists painstakingly put the fragments back together like jigsaw puzzles and placed the reassembled figures as they originally stood. Each laborer was an artisan who created a soldier in his own likeness, only taller. Individual warriors took 3 months to make and are entirely unique with carefully detailed hairstyles, facial hair, fingernails and clothing. The figures were then painted but the archeologists made a mistake back in 1974. As soon as the 5-meter-deep pits were opened and were exposed to air, the paint oxidized and faded immediately. I felt awed and touched by this magnificent display of art, culture and history so beautifully and lovingly restored. You are most certainly a “globe trotter” with your newest trip even more fascinating that your last one. I thoroughly enjoy reading your experiences.